So, Douglas Adams was talking about eBooks way back in 1993. This hilarious animation was prepared for a competition run by The Literary Platform. The goal was to design motion graphics to accompany a prophetic recording by Douglas Adams from 1993, in which the great writer was detailing the invention of the electronic book. If your are into science books – and enjoying the advantage of eBooks (or planning to), this is a web site you really must bookmark. Here is a list of the 15 writers involved – some you will no doubt recognise. 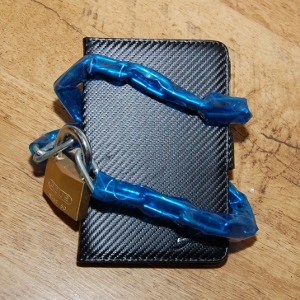 Check out others through the links. 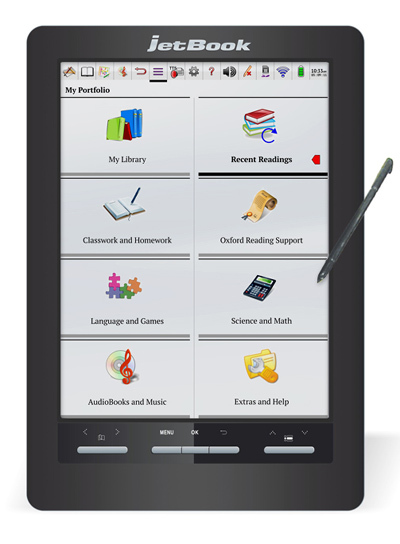 He also talks about the new possibilities introduced by tablets. Pity – although I guess those books probably get reviewed quite widely anyway. via Keep up with the latest science e-books and apps with “Download the Universe”. The last few days I have been reading a novel in the pBook format. 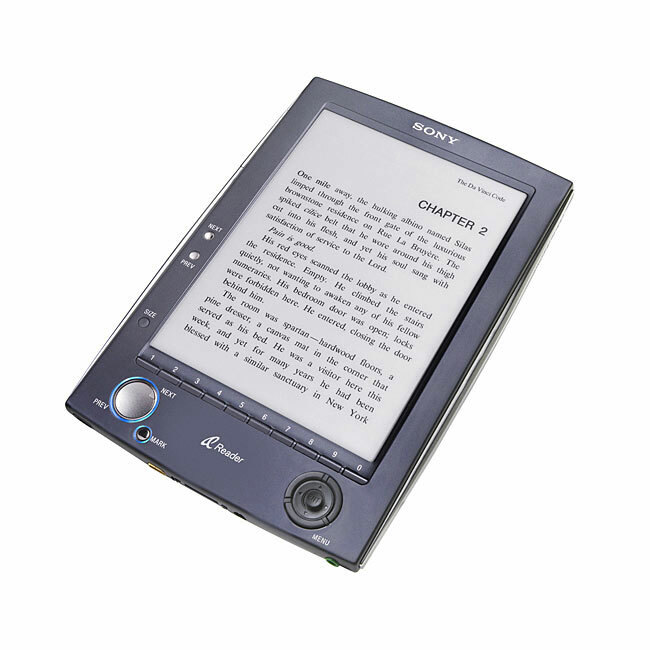 It’s been an interesting experience as since I got my eBook reader over a year ago (see The joys of eBook readers – the Sony PRS-650 Touch) I have read very few pBooks. People talk about the attraction of a pBook’s smell. Can’t say I noticed that. But I was frustrated that my habit of checking the meaning of new words with a simple click to a loaded dictionary was not available. It is so much more effort to take a dictionary down off a bookshelf and look a word up. I see this will also be a hassle with footnotes and endnotes in more technical books. Mind you – it was by no means an unpleasant experience – and I do still have a pile of pBooks yet to read. But I can really relate to the kids in the Cam Cardow Cartoon trying to get WiFi on a pBook. Have a look at The original e-reader – The Digital Age – sorry, can’t embed it here for copyright reasons. While on the subject of new ways of reading book – have a look at this video on the medieval help desk. The problems that readers had when the had to progress from scrolls to books. Well, I finally succumbed and got myself an eBook Reader. I am certainly not one of those who take up new technology early. Mind you, eBook Readers have been in New Zealand only since last May, so I do feel like a rapid uptaker in this case. Of course the late arrival in New Zealand has more to do with rights management than technology. 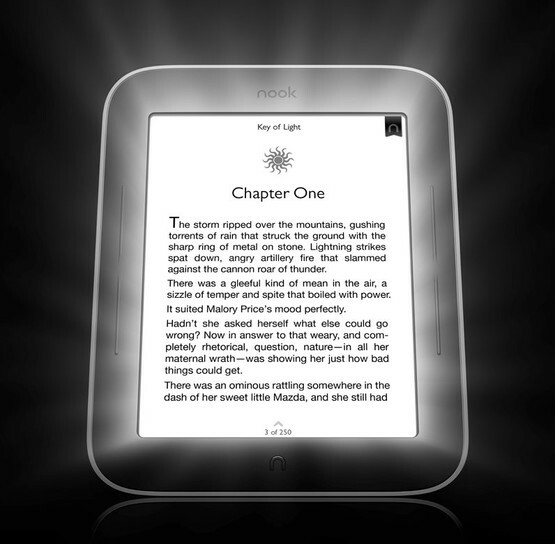 But the wait means that now eBook Readers have arrived many of the technological problems have been sorted. (And it has given me time to research the subject). So far there are just four eBook Readers on the local market (the Kobo and two Sony models), plus the Kindle from Amazon. And they aren’t easy to find in local shops! I did my own comparison and decided on the Sony PRS-650. 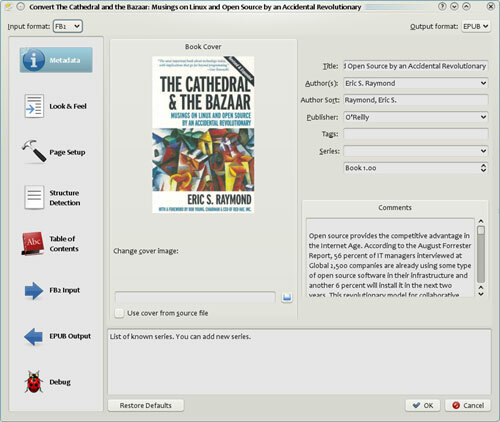 Here are my comments on this model, together with my general experience of using an eBook Reader overt the last few weeks. 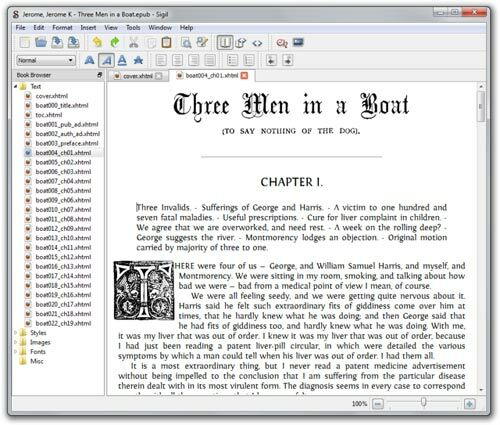 It’s not a detailed review (I haven’t had hands-on experience with other Readers) but you might find it useful if you are contemplating purchase of an eBook Reader. The latest US book industry sales figures from the Association of American Publishers show ebooks are now tracking at 9% of domestic trade book revenue for the 8-month period January to August 2010. 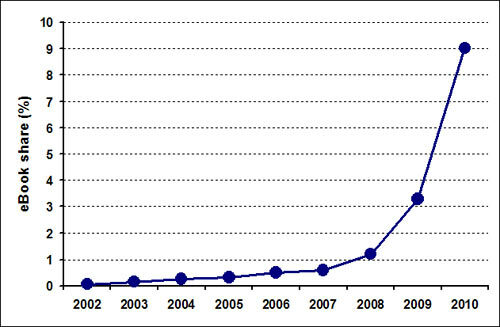 To put this in context I have plotted the ebook share of total consumer book sales in the US for the last years. This certainly looks like ebook sales, and presumable sales of ebook readers and similar devices, is taking off in the US. As Martin points out Amazon’s Jeff Bezos claims that when both printed and e-book formats are available their sales are about 35% ebooks! Mind you, I think this sudden increase may be partly caused by the more recent availability of improved ebook readers, devices like the iPad, and on-line ebook stores. If so, we might expect the increasing trend to slow and some sort of equilibrium reached in the next few years between sales of ebooks and printed books. Unfortunately in New Zealand we are well behind. 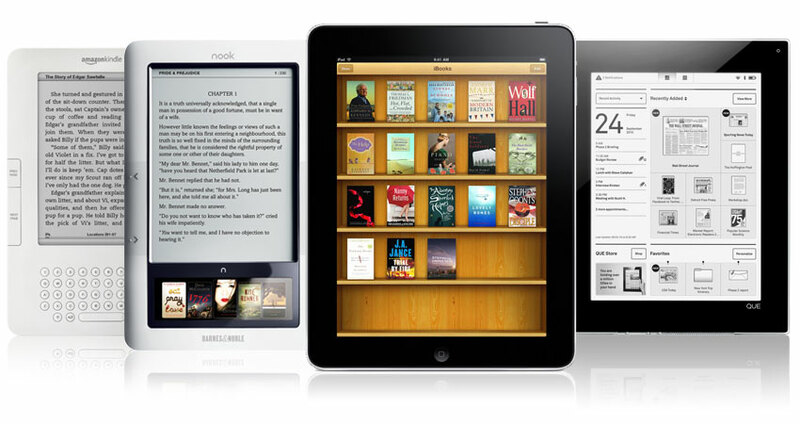 Ebook readers, and the iPad, have only become available this year. So far there are just four ebook readers on the local market (the Kobo and two Sony models), plus the Kindle from Amazon. And try to find them in the local shops! On the other hand the price of the Kobo has dropped $50 recently suggesting that we will soon see more competition, and lower prices, in the New Zealand market, as overseas. Footnote: I was interested to see that science writer Carl Zimmer is experimenting by releasing his most recent book purely as an ebook. (see Brain Cuttings). He found it quick to produce and it’s certainly quicker for the reader to obtain. If this catches on with authors I am going to have to splash out and get my own ebook reader. I am sure this is true. It’s the details of that future I find confusing. People in the publishing industry are talking about being on the cusp of a change. Similar to that which previously hit the music industry (see Is the e-book reader a new chapter for literature?). There’s no doubt digital formats are taking off. But, that doesn’t mean the printed book is doomed. And many details of electronic book readers are still not sorted out. The big issue is of course copyright and digital rights management. 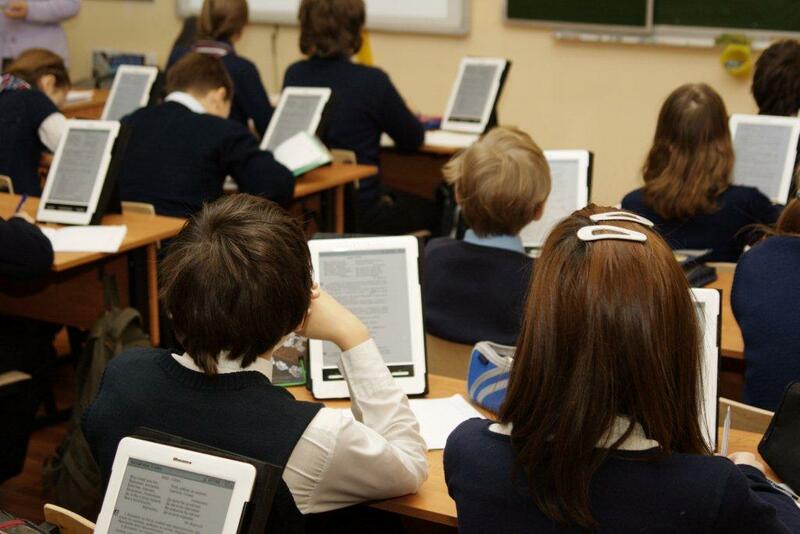 This has meant that while digital book readers are becoming more common in the USA (eg. 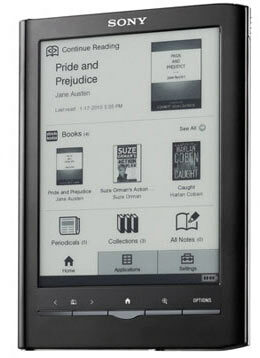 Amazon’s Kindle) they are not yet being sold in New Zealand and most other countries. That’s frustrating for people who want practical examples. Some New Zealanders have brought e-book readers overseas – but I usually want to try before I buy.